The popular black tea consumed in the west is in fact green tea, except the leaves have been dried for a longer period, which gives it its distinct taste and color. Tea is a rich source of calcium, magnesium, sodium, potassium, phenolic pigments, purines, theophylline, vitamins, chlorophyll, tannins and caffeine. Tea prevents formation of blood clots and plaques within the arteries. Plaques are in fact made of a mixture of dangerous fats and cholesterol. Dutch researchers found that Flavonoid's of black tea can reduce Low-density lipoprotein (LDL) cholesterol, which can cause heart attacks and strokes. Black tea can also prevent the growth of cancer. Other properties of the black tea include preventing osteoporosis, fatigue and stress, and tooth decay, decreasing the level of cholesterol, relieving arthrosis, curing herpes, and also burning fat. With the help of natural essences, tea can be tailored to suit any taste, and everyone can enjoy its medicinal benefits such as prevention of cancer and burning of fats. Cardamom can improve digestion, strengthen the heart and kidneys, prevent the production of throat mucous, and cure poisoning. 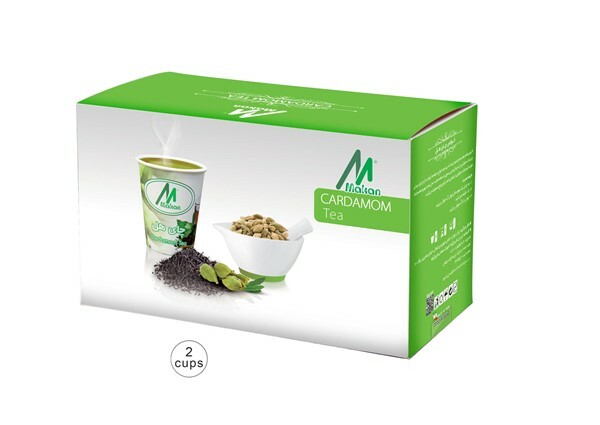 A new genius idea is to fix cardamom-flavored tea pods in the bottom of paper cups, making it possible to prepare a delicious and healthy herbal tea in just a minute. These environment-friendly flavored tea cups are recyclable, and can save up time and energy.